s of the communities of Brownsville, East Flatbush, and beyond. The exhibit includes artwork by the museum’s Artist-in-Residence, Iviva Olenick alongside artists she worked with as part of her residency at Midwood Active Adults. 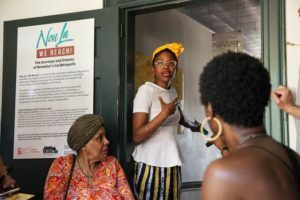 Brooklyn Arts Council’s Nou La–We Reach! program is supported by the Lincoln Center Cultural Innovation Fund, which is generously supported by the Rockefeller Foundation and administered by Lincoln Center.